One of the great things about pumpkins and gourds is that they can be used as festive decor for both Halloween and Thanksgiving. Chances are you still have one or two little <a href="http://www.inhabitots.com/how-to-make-homemade-organic-pumpkin-puree/">pumpkins</a> still lingering amongst your Halloween decorations. While you can reuse them in your <a href="http://www.inhabitots.com/index.php?s=thanksgiving">Thanksgiving</a> decor for the rest of month, I know a better way to enjoy them. 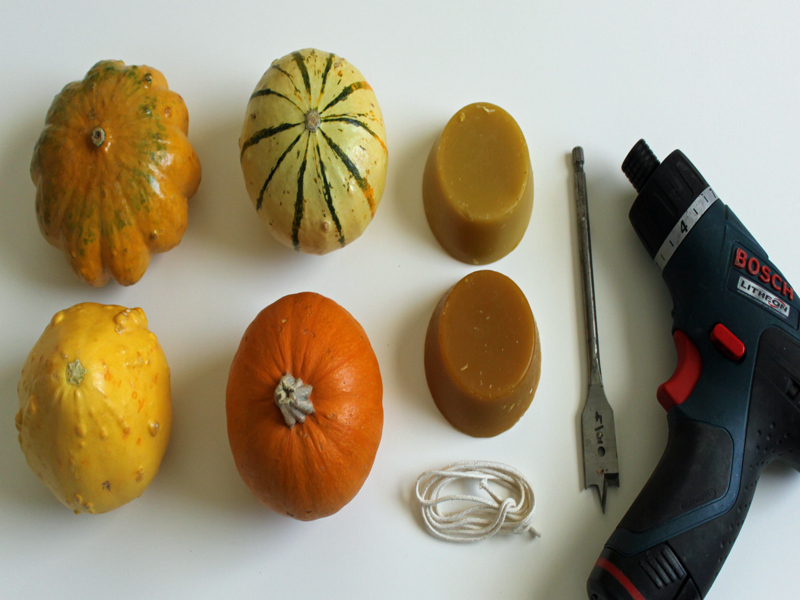 In a few simple steps, you can transform those loose pumpkins into illuminating candles for the Thanksgiving table. This is a fun activity that the entire family can do together, and these pumpkin candles also make great hostess gifts if you have been invited to Thanksgiving dinner at a friend or family member's home. Read on for the easy to follow tutorial. 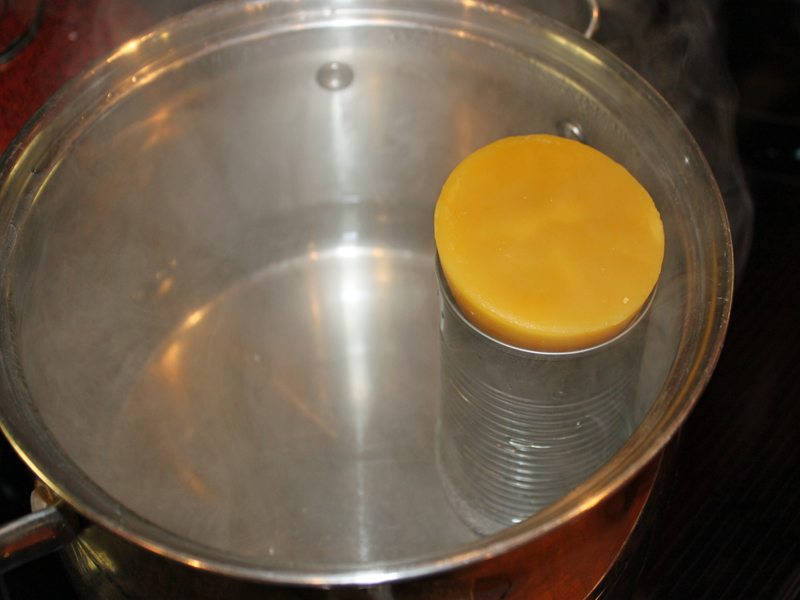 <h2>Step 1: Melt the Wax</h2> Add enough water to the pot that a tin can will sit without tipping over. 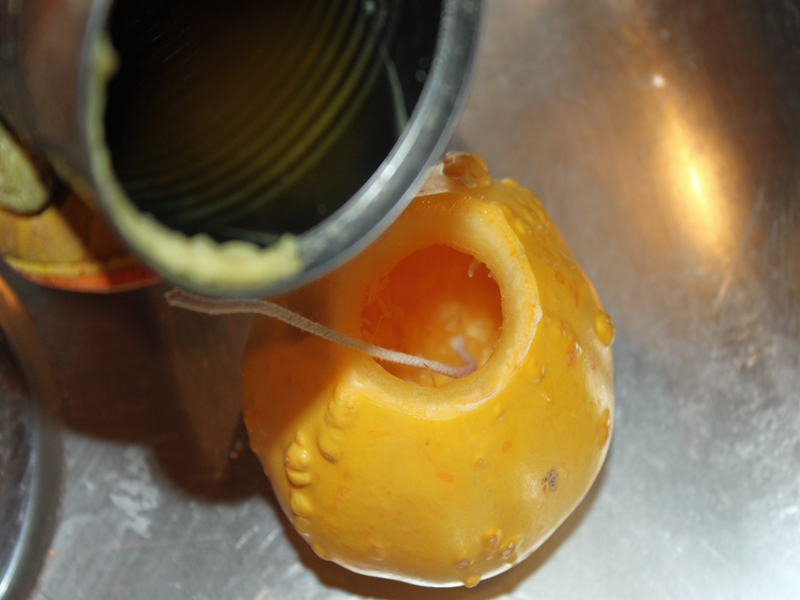 Place the beeswax inside a tin can and leave until the bowling water melts it down to a liquid. 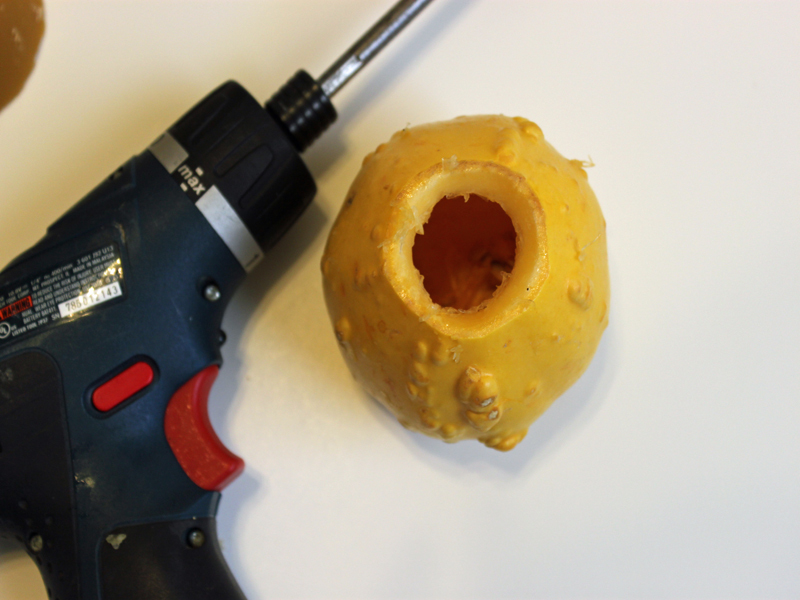 <h2>Step 2: Drill the Holes</h2> While the wax is melting, use a drill bit to drill a hole in the top of the pumpkin or gourd and remove any seeds. You can also cut the top off of the pumpkin or gourd and use a spoon to remove the seeds. 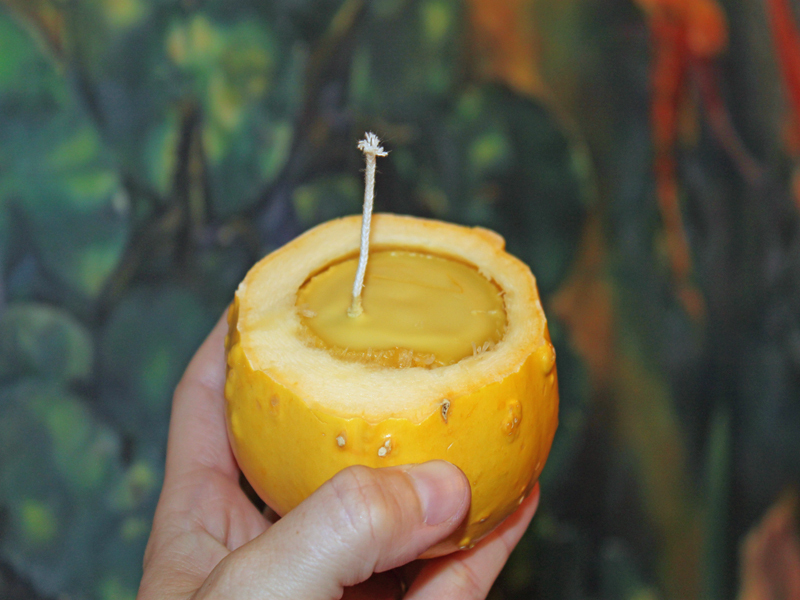 <h2>Step 3: Add the Wick</h2> Cut an appropriate length of wick and place it inside of the hollowed out pumpkin. 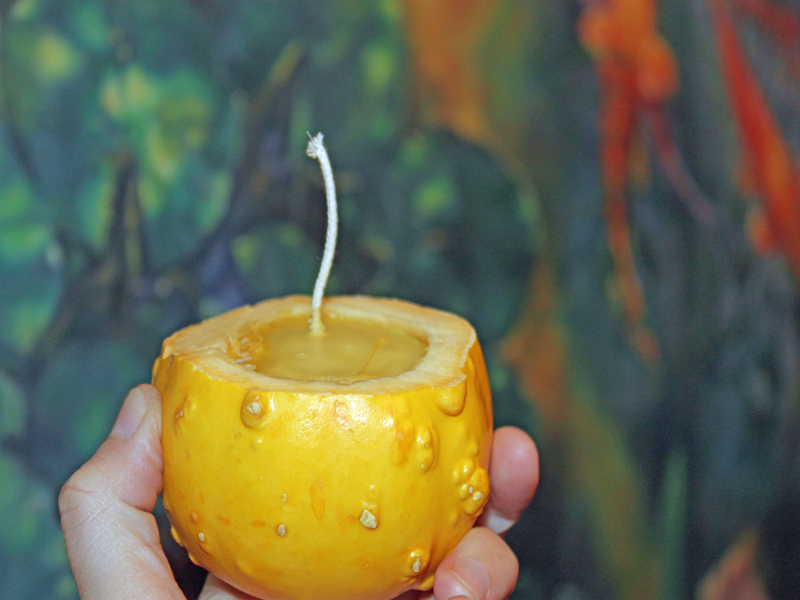 <h2>Step 4: Fill the Pumpkins</h2> Have an adult helper hold the wick in the center of the pumpkin while you pour the hot wax until pumpkin is full. 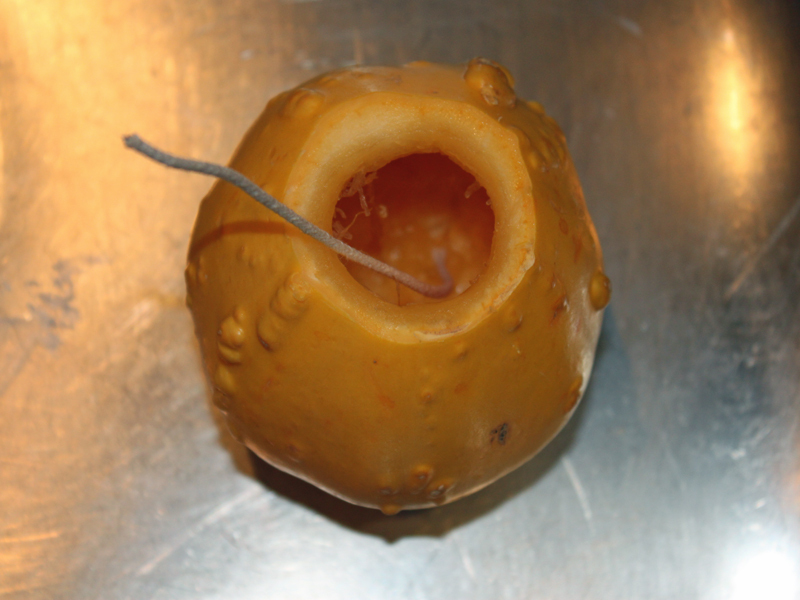 If you don't have enough wax, you can cut the top of the gourd down to make an even top. <h2>Step 5: Let it Cool</h2> Allow the wax to cool and completely harden in a place where it won't be disturbed. 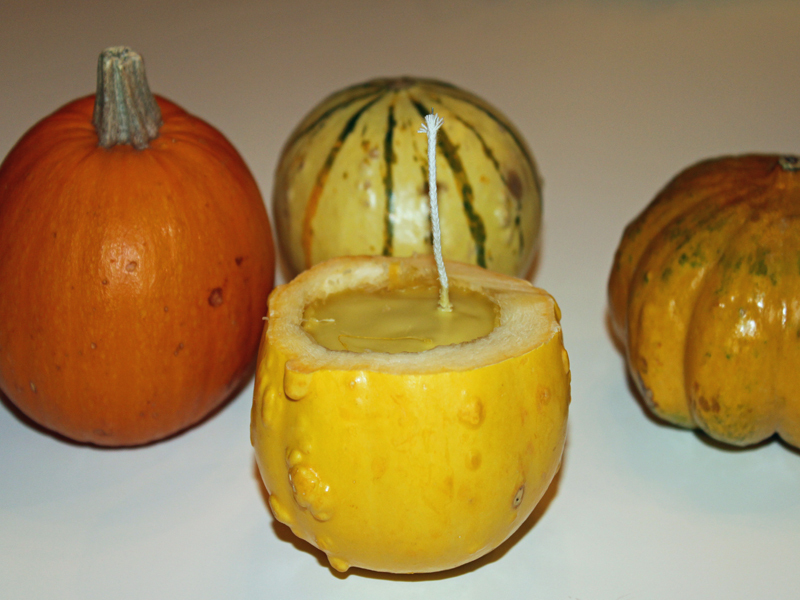 <h2>Step 6: Decorate and Enjoy!</h2> Use these yummy smelling pumpkin candles to adorn your Thanksgiving table! One of the great things about pumpkins and gourds is that they can be used as festive decor for both Halloween and Thanksgiving. Chances are you still have one or two little pumpkins still lingering amongst your Halloween decorations. While you can reuse them in your Thanksgiving decor for the rest of month, I know a better way to enjoy them. In a few simple steps, you can transform those loose pumpkins into illuminating candles for the Thanksgiving table. This is a fun activity that the entire family can do together, and these pumpkin candles also make great hostess gifts if you have been invited to Thanksgiving dinner at a friend or family member's home. Read on for the easy to follow tutorial.